It was at the music launch of Teri Meri Love story that we were spell bounded by the stunning Ushna Shah in her glamorous black outfit. Ushna Shah in her gorgeous black dress seemed all ready to hit the big screen. The Pakistani movie Teri Meri Love Story is a comedy romantic film. The director of the movie is Jawad Bashir. 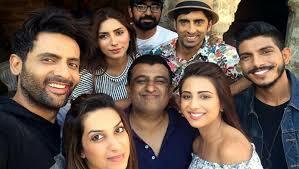 Whereas the cast includes Ushna Shah, Mohsin Abbas, Mohib Mirza, , Salman Shahid, Omar Shahzad and Uzma Khan. The movies is expected to release in the month of September.